We've made it to another month day! Happy 10 months, Elise! Also, a note: a took her pictures on the actual day, but I have been remiss in my chronicling duties and am posting about it a week late. Alas! The most notable thing to occur this month was the big trip, of course. That included several milestones for Elise: first international trip, first passport stamp, first croissant, etc. But she's glad to be home now, exploring her familiar things and places, and she's growing like a weed. Her 9-month clothes are getting too short, and I'm packing up some of my favorite outfits in favor of ones that fit. 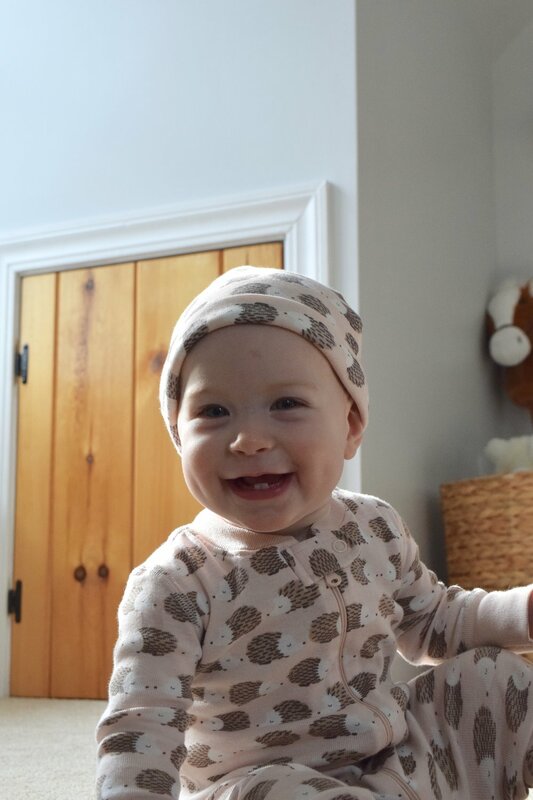 While I normally start with the standard white onesie shots, I decided to first pay homage to her hedgehog pajamas with the matching hat, since they're going to end up in the storage box after their next washing. She's been practicing standing all on her own more and more lately, usually when she's absorbed in something (like removing all of the books from her bookshelf). She has also expanded her vocabulary a bit, using more consonants and speaking in what sound like full sentences of gibberish. We also discovered that she has sprouted yet another tooth, bringing the total up to five. I suspect that the same tooth on the other side is on its way in as well, but she hasn't been complaining about it. As a result, it may be a little while before her mouth gets into a symmetrical state again. She's totally pulling off the look though. She has also been sampling a ton of foods! She'll eat whatever is on my plate, and so I've tried to become more intentional about making her a little miniature meals at mealtime so that she gets a substantial amount of solids each day. That works some days and other days she subsists entirely on milk, but since food is more for exploration than nutrition at this point, I think she's doing just fine. As of eight or nine months, she began playing games with people, usually with Chaz, where she leans all the way over to one side when she's sitting or standing and expects you to reciprocate. Once you've leaned over to match her, she'll lean the other way and wait for you to follow. She thinks it's hilarious and the game is typically accompanied with lots of smiles, babbling, and giggles. And whenever she's in the presence of a light blanket, you can be sure she'll play peekaboo with you. She pulls the blanket up so it's covering her face, and when you ask where she is, she'll pull it down with gusto and grin. She has also developed a strong affinity for climbing anything and everything that she can, so stairs hold a particular fascination for her. However, when stairs are not available, the nearest chair suits her just fine. Fear not; I rescued her immediately once things started heading that direction. When not climbing, her preferred activity of late has been reading, which I love. She sits on our laps to read, and when we get to the end of the page, she'll reach with her left hand (only - never the right) and turn it. She really loves lift-the-flap books, and her absolute favorite is Dear Zoo. She gets very excited when we begin, and her excitement culminates on the page with the lion. So much so, in fact, that when you ask, "Elise, what does a lion say?" at any point, she'll roar. It's the best. We're still working on monkey and elephant noises, since those are some of the other animals in the book, but having the lion noise down pat is pretty great. I think that's all I have to report for the moment. See you next month for another report!